I remember being sent home from school. Walking home down 34th street from Forest Park Elementary. Something terrible had happened. The teachers said we needed to be with our parents. I remember watching our black and white TV into the night. The news that Kennedy had died just too awful to believe. My father was a funeral director. I was accustomed to hearing about death. I didn’t quite understand an assassination. I remember my mother talking about how terrible it must be for Jackie. And for those children. We had been shown how to hide under our house many times. Pine Bluff, my home town, was supposedly a target during the Cuban Missile Crisis because of the Pine Bluff Arsenal, where highly dangerous weapons were secreted. The day Kennedy died, I remember fearing that we would have to go under the house. Maybe live there for a while. I think I felt that Kennedy had saved us from that crisis. I don’t know if that was politically correct or not. I just remember feeling that as a child. We were in danger again. Other than those distinct things, I and I am sure you, have watched countless documentaries of this tragedy. It is hard to know what are my true memories and what are artifacts from those accounts. 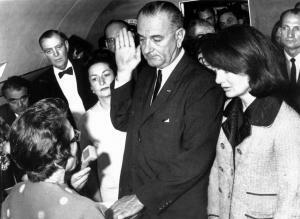 The iconic pictures – Jackie, standing by Lyndon Johnson as he was sworn in; young John, standing and saluting. They feel a part of my personal memory. One a photo, the other what we watched on TV. People grieving. Saying good-bye. Going on. I think perhaps that’s what I remember the most. Watching that tremendous sorrow. Raw. Evident. So intimately personal. We felt it as a nation. We could not possibly feel it like his family did. My dad’s father had died when he was 15. He rarely talked about it. 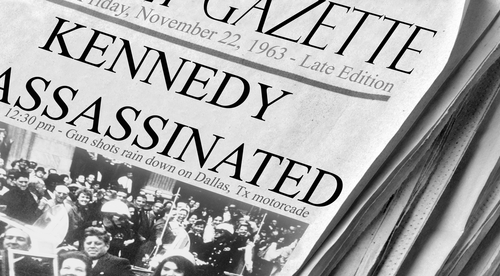 Maybe, when President Kennedy was killed, I began to see grief for the first time in my young, fairly naive life. I so wish that I had begun to learn some other way. My thoughts and prayers today to all who knew and loved him. And to our continued healing as a nation for the many that we have lost. Thank you for reading.